Oldcastle Infrastructure announces that the BioPod biofilter with StormMix media, a high performance, high flow rate (153 inches/hour) soil, has received a General Use Level Designation (GULD) for Basic, Phosphorus and Enhanced Treatment from the Washington State Department of Ecology (Ecology). After a comprehensive review of field data, Ecology has approved the BioPod with StormMix media for applications where removal of at least 80% of total suspended solids (TSS) and 50% of total phosphorus is required, as well as significant reductions in dissolved metals like copper and zinc. BioPod systems use an advanced tree box filter design to provide filtration, sorption, and biological uptake to remove TSS, nutrients, dissolved metals, gross solids, trash and debris, and total petroleum hydrocarbons from stormwater runoff. Environmentally friendly and aesthetically pleasing, the BioPod biofilter is a proven, Low Impact Development (LID) solution for stormwater treatment. 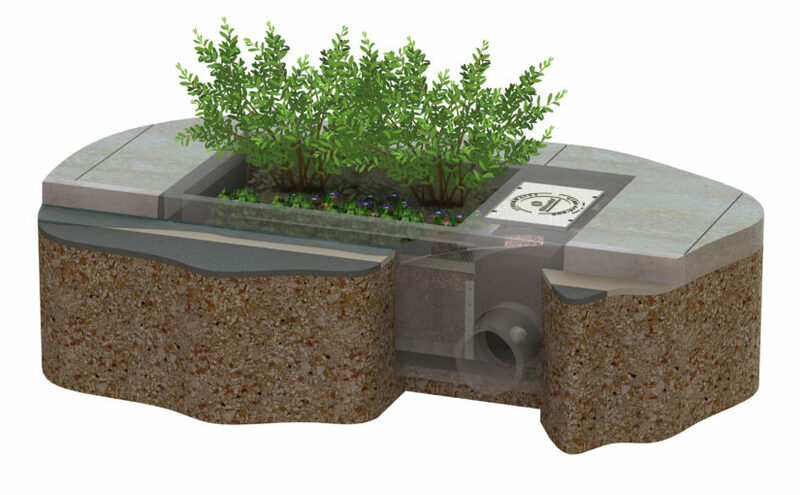 BioPod structures integrate seamlessly into standard site drainage systems and can accommodate a wide variety of vegetation to meet green infrastructure requirements. The BioPod biofilter with StormMix media, is offered in four configurations: BioPod Vault with StormMix Media only, BioPod Planter with Vegetation & StormMix Media, BioPod Planter with Tree(s) & StormMix Media, and BioPod Underground Vault with StormMix Media only.